It's a matter of opinion, of course, but anyone accusing Rush of milking the market with this latest DVD, live CD and vinyl from this tour, would certainly have a point. I'm sure some will have to draw the line somewhere, but hopefully not before picking up this top quality set from this year's 'Time Machine' tour. Beautifully filmed and recorded, the setlist this time varies greatly from the other three live Rush DVD's of recent years. 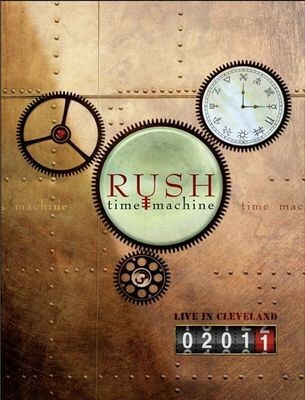 With around two and half hours of music, Rush are also at their instrumental peak. It's fair to say that the first set is tailored towards die-hard fan, with opener 'The Spirit Of Radio' and closing trio 'Freewill', 'Marathon' and 'Subdivisions' wrapped around a collection of slightly lesser known and barely played songs from the dense Rush back catalogue. There's the rare sight of guitarist Alex Lifeson playing keyboards on the commercial 'Time Stands Still', the title-track from 'Presto', the aggressive 'Stick It Out' and the menacing 'Workin' Them Angels' from the last album. The instrumental 'Leave That Thing Alone' turns into a Geddy Lee bass showcase towards the end, but probably the most unexpected tracks are 'Faithless', a song from 'Snakes & Arrows' that hasn't been played before, and the brand new 'BU2B', which indicates that the next album may see them returning to a heavy power trio. The main part of the second set is taken up with the whole of 'Moving Pictures', which is a great idea as it's the one that everyone seems to love, even if they do slightly trim the highly anticipated 'The Camera Eye'. Personally I don't go a bundle on some of the new sound effects and back projections, particularly the circus noises that drown out the opening riff to 'Limelight', and 'Vital Signs' doesn't flow as well as the album version, but the intro video to 'Tom Sawyer' and the general clowning around that backs most of the song, is inspired and indicative of their sense of humour. They follow it up with the other new song, the sinister 'Caravan', before Neil Peart's excellent drum solo and Alex Lifeson's acoustic guitar piece, which morphs into 'Closer To The Heart'. The fun rendition of 'Overture/The Temples Of Syrinx' is always entertaining and would have made a great ending to the set, although for reasons best known to themselves they follow it with 'Far Cry' as the set closer.